A straight-edge razor is a valuable blade for men who want smooth faces, but they may not know which ones to buy. Believe it or not, old vintage models are the very best models of these shavers. Although most people wouldn’t bother with old relics, most straight-edge razors generally last much longer than convention razors. There are many reasons why people should look into buying a straight razor. The shavers help men cut the hairs more closely to the skin. The fresh feeling of the shave comes from the position of the blade. Hoe-shaped disposable razors typically require people to apply pressure on the handle. This often keeps the blade from gliding as easily across the skin. Straight-edge models, on the other hand, shave with a larger blade along the side of the face. This is a much smoother operation, because it keeps users from nicking themselves from applying too much pressure. People often debate whether they should really spend a lifetime hunting for a vintage straight-edge from the early 1900s. They really don’t need to go to the trouble to hunt for such a rare artifact. Most people can easily settle with a standard Dovo razor from amazon.com. The least expensive razor models typically cost only $20 to $30. 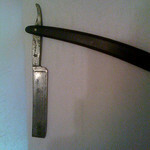 Users also have an easier time maintaining their straight razor. Disposable razor cartridges are often extremely expensive. Some eight-packs of cartridges can cost up to $30. People will never need to purchase additional cartridges for a straight-edge razor. They only need to keep their single blade sharp and clean. When shopping for a straight razor, always pay close attention to the quality of the blade. Stay away from razors that have chips in the blade, burn marks or substantial rust. These elements can keep the shaver from providing fresh, clean beard cuts along the face. Be sure to purchase a strop, which is a leather strip or piece of canvas that is used to polish the blade. This is an important accessory that is used to wipe the blade and polish off any imperfections along the edge. In order to hone the razor properly, the owner should lie the blade flat on the side, against the strop. The person should stroke the blade evenly, using an equal number of strokes for each side of the blade. Various other websites also provide tips for first-time strop users. The procedure may seem difficult, so people should look up classicshaving.com and other reference sites for advice. There are also many ways in which a person can restore their blade if it is starting to lose its sharpness. If the product is somewhat rusty, shine it up a little by rubbing sandpaper along the side. This helps to buff off any rough parts on the razor that may irritate the skin. If this isn’t enough, some professional razor vendors can revamp the straight-edge device. A revamp servicer can remove any soap scum and hone the blade by using various sharpening stones. The sharpener can also polish off the handle so that it is easier to hold in a person’s hand. Straight-edge safety razors may seem like rare oddities, but this tool carries numerous advantages. They are certainly worth the time and effort involved in finding one.